The potholders finished faster than I had expected so I went back to the project that I had skipped in 1, 2, 3 Sew to get some of my skills before heading onto my other holiday sewing. I found the most amazing chevron canvas online but I struggled with selecting the interior color. How would I know if I got a match? It turned out PERFECTLY and I couldn't be happier. The scaled of the outer canvas is PERFECT. One side of the caddy takes up almost an entire repeat of the fabric. I am super excited! To cut the outer fabric on the fold, I pressed it in half along one of the chevrons. Hopefully this will allow me to match up the pocket fabric correctly. I haven't cut on the fold like this before so I'm nervous, but there is plenty of fabric in case I mess up. It worked it worked! I matched both sides of the caddy and the pocket. This project has more cut pieces than any other project I've ever created. I'm not going to worry about anything else matching up. The bottom I also cut folded which was a MUCH nicer way to cut a 30" wide piece. My cutting mat is only 24" wide so cutting on a fold works fantastic. no cut and move and hope things are lined up here! Since I didn't have "ultra heavy weight interfacing" but Pellon 88 (craft fuse), I cut two layers (8"x30"). I folded the interfacing in half to cut the long width, wow this is getting so much easier for me! The instructions do say "for areas that require extra rigidity, use 2 layers", so my thought to use 2 layers isn't unusual. I ironed it on with the wool/steam setting. For the vertical stitching, I squared the measurements against the top of the pocket hem. I used my air soluble markers to draw the lines and then stitched the pockets. I'm getting so much more confident doing lines! I'm also really happy with the way these lines ended up centered along the center chevron of the fabric pattern. looking good! Now it is the hard step, adding the bottom of the bag onto the sides. I'll be sewing around curves with one really thick piece of fabric (the bottom has two pieces of Pellon 88 interfacing attached!) 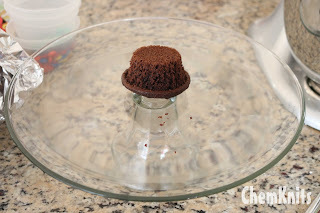 When Pinning, I first pinned the two edges so the top would be square and then pinned the center of the bottom piece. Heading out from these three pins helped me pin the fabric evenly and without any major gaps. Now I just have to sew it. After turning the bag right side out, I feel like I should notch the seams a bit more to help it hold its shape better. Overall I'm happy with how this step tuned out, and we'll see what is needed as I move on to sewing up the lining. Blast! My bobbin is doing fine but I'm running low on thread! There is no way I'll have enough to complete this project. I was hoping to use up this heavy weight thread and then get the same color in a more normal weight to do some other projects but man am I out of luck. I'll keep going as far as I can and hopefully run to the fabric store tonight. I finished half the second caddy compartment before I ran out of thread. Unfortunately my JoAnns didn't have any of the "heavy" yarn in the color so I got "jean" weight yarn which is EVEN HEAVIER if you can imagine that. I certainly didn't want to use a thinner yarn now that I have some visible stitching on the outside, so hopefully this will look okay in the end. I had to trim about half an inch or so off the top of either side compartment. There is a lot of bulk on the seams of this bottom piece. When sewing on the squared off center bottom, I wasn't able to get even close to the corners because of the amount of bulk (see above picture.) I did the best I could and then finished off the corners by hand so items won't slip through the lining in this craft caddy. After pinning the lining in place of the outer bag, things didn't lay quite right. I notched the seams of the outer bag a bit more (past the initial 1/4" stay seam) and trimmed the 1/2" seems of the inner lining. Hopefully this will help things lay flat once it is all assembled. I purchased two different types of cotton webbing for handles in this project. I got 1" wide white and 1.5" wide natural. The pattern calls for 1.5" webbing but fabric.com only carried it in the natural color and I wasn't sure how this would look against the awesome chevron print of the outside of the bag. Ultimately, when I compared the two straps I decided to go with the natural 1.5" width. This color is represented in the fabric and I like the look of the sturdier straps. This chevron pattern has been magical for me with this project. 3" from either side + the 1.5" strap framed the center chevron PERFECTLY. I could not have planned this out better if I had tried. There is one step left of this bag project, folding down the edge and stitching around the outside. I'm nervous. Will the bag stand up? Will it look strange? I want to fold and press the seams and the pin them together to try to get the best alignment possible. I started by pinning the inner and outer bags together a few inches down from the top to hold the bags together. I made sure the tops lined up, but this way I could press things into place without worrying about things slipping around. The bag actually looks pretty good at this stage. Deep breaths. The bag is all pinned up and now I just have to stitch it together. Are my seams the neatest? No. i still need more practice sewing a bottom onto a curved edge. I wish there was a way to press these seams out but I'm not skill ed enough with an iron. This is by far the most complicated pattern I've ever assembled, and although it is not perfect I'm thrilled that I created it with my own two hands. You can't tell the difference between the heavy and jeans weight thread unless you look really closely. Phew! The bag also stands up way better than I had expected. It might not be perfect, but it is perfect for me and I made it all by myself! As soon as I finished taking the pictures I filled the bag with sewing tools and it now lives on my sewing table. I'm not sure I'd make this exact pattern again but I'm really glad that I challenged myself to make something complicated. I do know that I love this fabric and can't wait to make something else out of it. 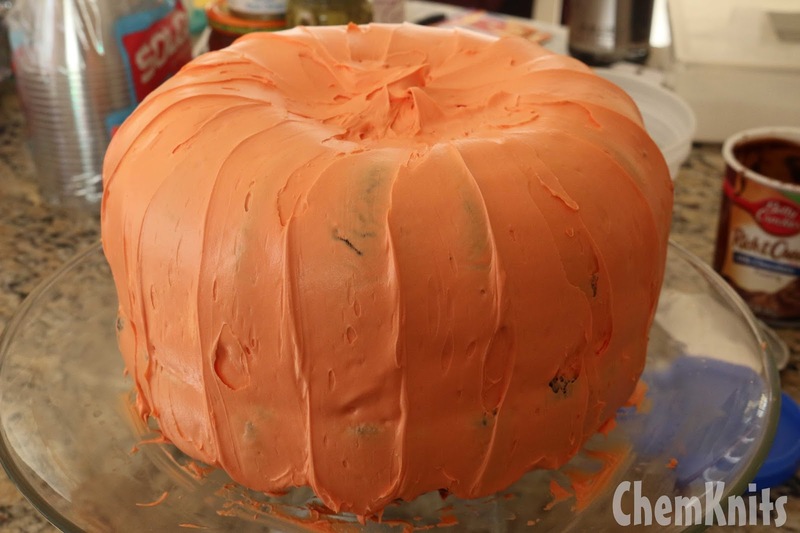 I saw a cool cake on pinterest when I was researching Lucky's Halloween Birthday Party, a pumpkin layer cake where the layers were created in a bunt cake pan. 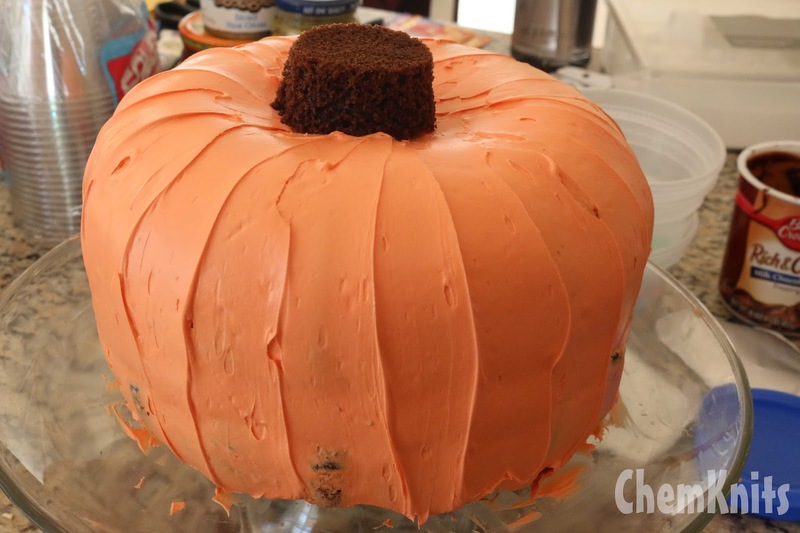 The holes are filled in with some cupcakes and then when frosted you have a round pumpkin. Worth trying, right? 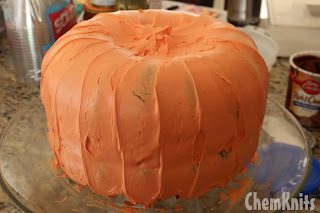 For Lucky's actual birthday, I did a test cake that was one half of the pumpkin. Since I wanted to have cake on his birthday anyway, this was going to work out fine. 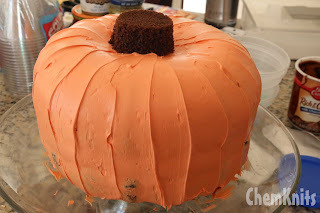 I created one "layer" and 4 cupcakes out of one box of cake mix and made the top half of the pumpkin (not pictured). It looked great! Now on morning of Lucky's party I had to assemble the whole thing. I used two boxes* of cake mix to create a few cupcakes plus the bunt cake layers shown above. 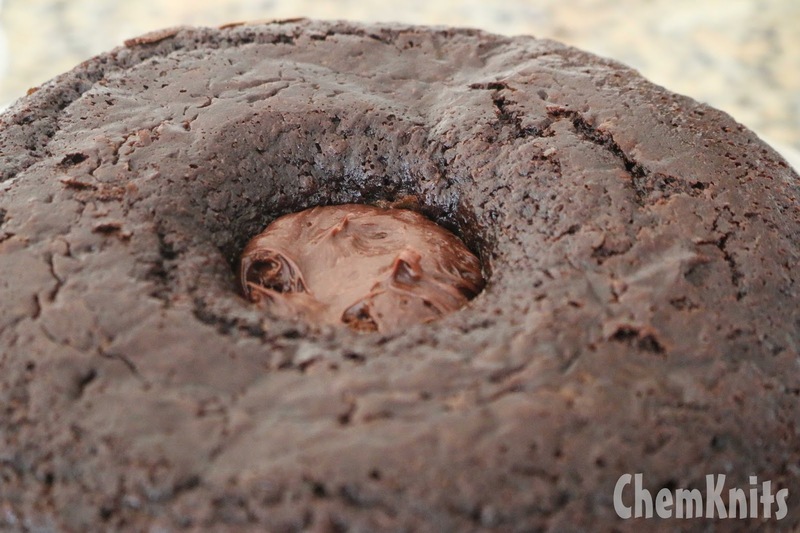 *I actually had to use 3 boxes of cake mix since one of my layers broke when I was taking it out of the pan. AHHH! 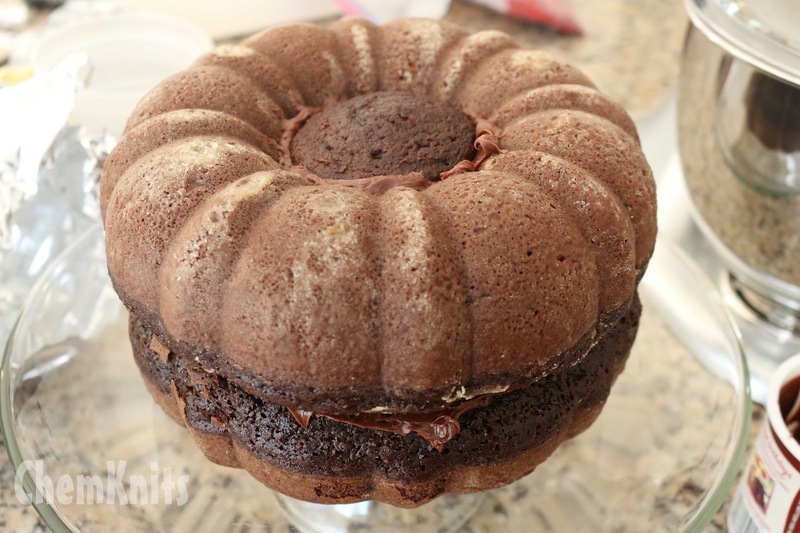 I crumbled up this cake and turned it into "dirt" with sour gummy worms for an extra Halloween treat. From a fail into a win! 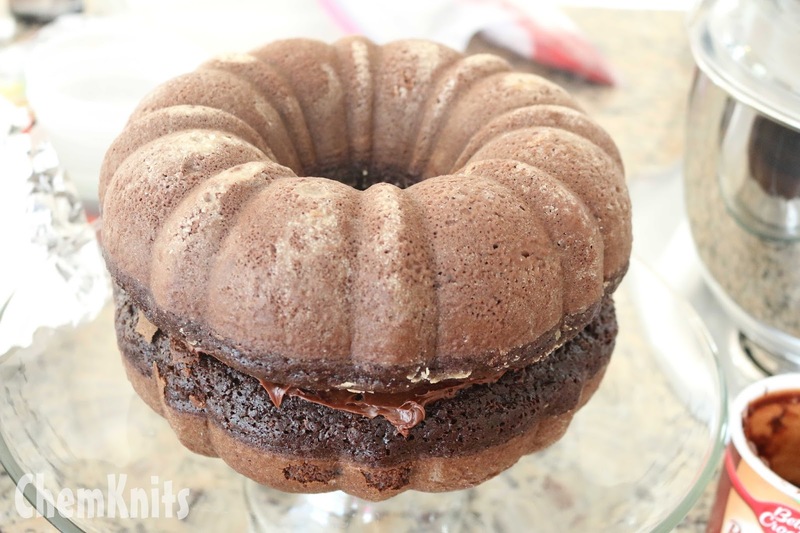 Each layer got a cupcake surrounded in chocolate frosting on the bottom and top to fill the bunt cake holes. 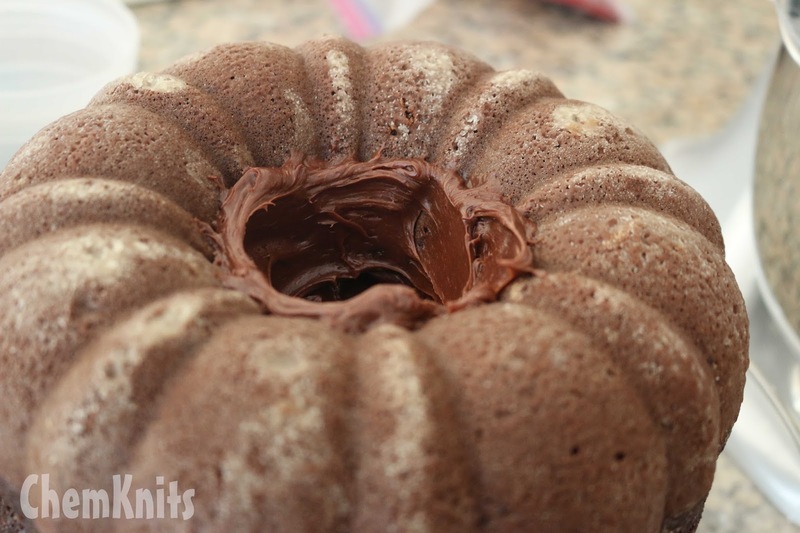 The outside of the cake would be orange, but the inside layer was filled with chocolaty goodness. 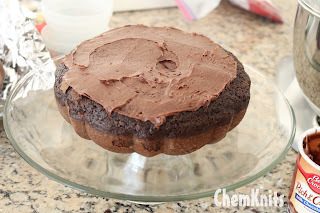 I was afraid I'd break a layer again as I put the cake together but it actually went pretty smoothly. Does this count as more than a 2 layer cake since I'm also layering in cupcakes? I used store bought frosting for the cake... 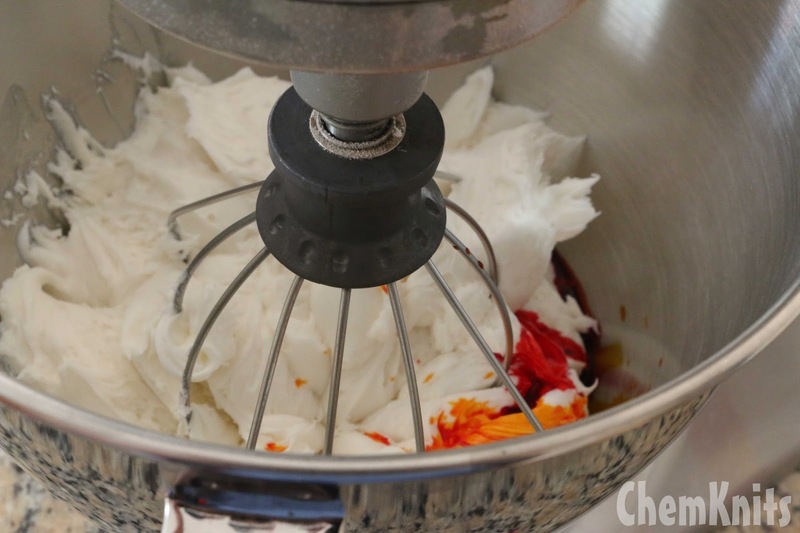 I've never made a frosting that I like that much and I just didn't have time to do it from scratch anyway! 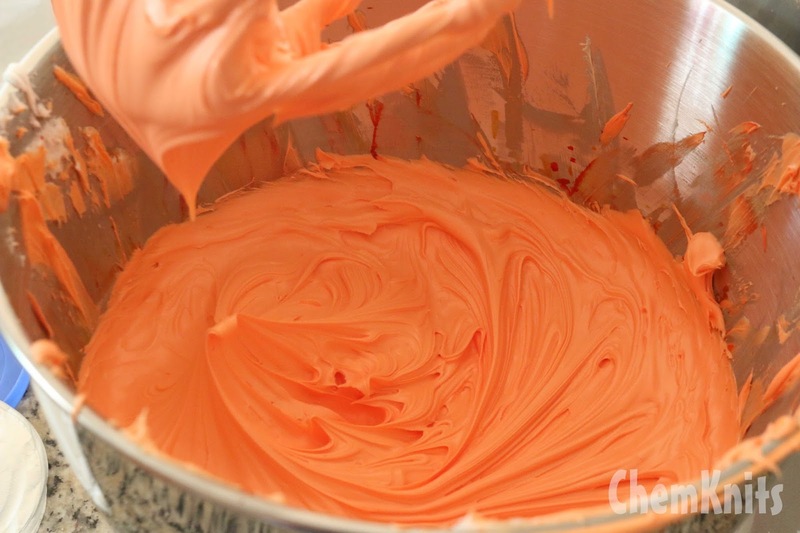 I did enlist the help of my electric mixer to create deep orange. I don't remember how many food coloring drops I used, but let's just say that if I were dyeing 100g of yarn that I would have used less food coloring to get a deeper color than I needed for these 2 tubs of white frosting. 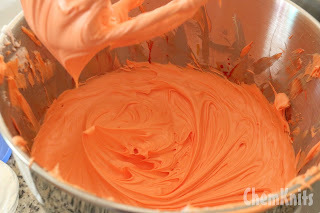 I had just enough frosting to do the outside of my pumpkin cake plus the top of some mini pumpkin cupcakes (not shown here.) When icing the cake the pumpkin ridges came from the icing spatula versus the shape of the bunt layers, but I'm still really happy with the overall shape. 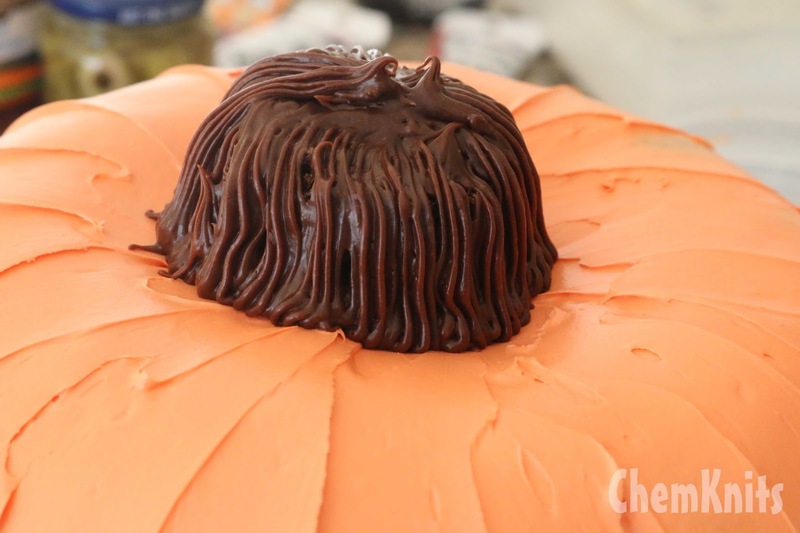 Maybe next time I'll use less cake batter for each layer to make a shorter pumpkin, but I think that it looks pretty awesome, don't you? 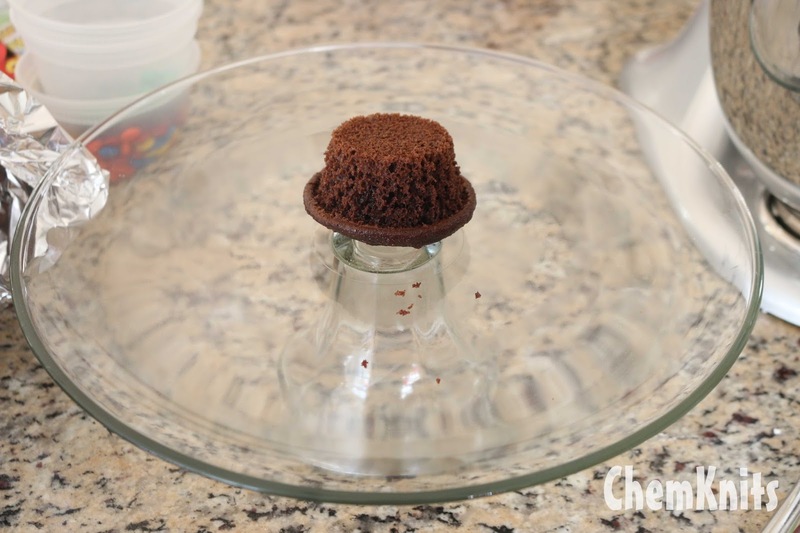 Lastly I put a trimmed cupcake upside down on top to make the stem and frosted it with chocolate frosting. I'm thrilled with out this cake turned out! 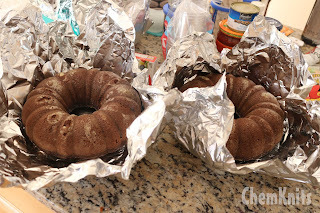 It is more effort than a normal layer cake because I only have one bunt cake pan so I had to do two (cough, three) batches in the oven. 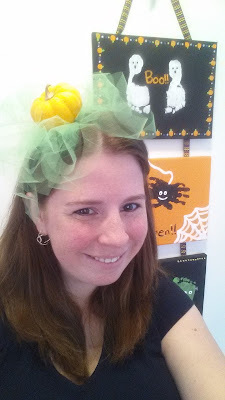 I considered drawing on a Jack-o-lantern face on the side but I couldn't bring myself to mess up my lovely pumpkin. What if I didn't love the face I drew? 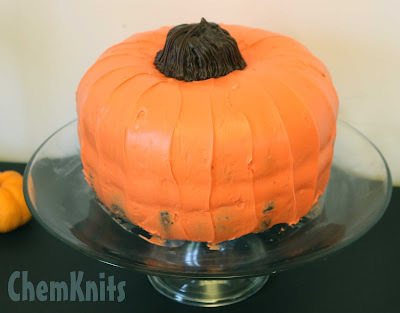 I love how this little cake turned out and it is perfect for a Halloween themed birthday party! I wish I had some taken some photos of the cake sliced, but I spent the party visiting with my guests and playing with Lucky. 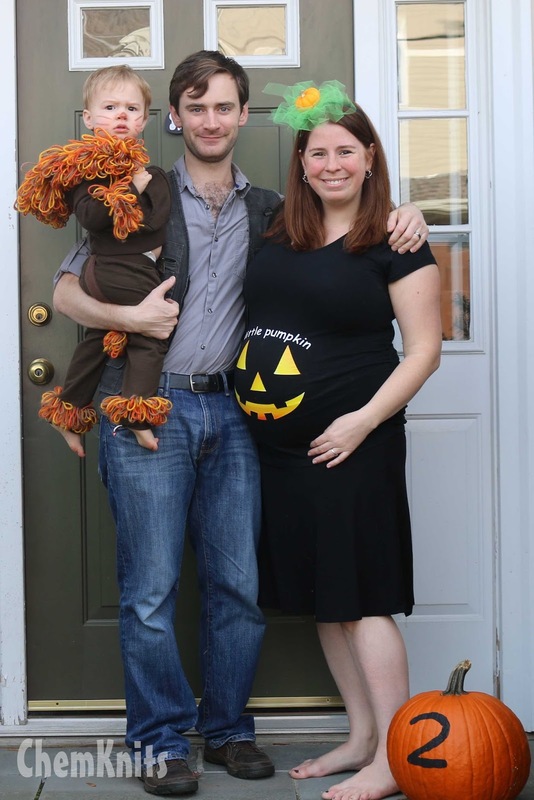 Maybe next Halloween I'll do this again!